Finding Fanny trailer video creates a buzz within hours of its release. The trailer video of the Deepika Padukone and Arjun Kapoor starrer ‘Finding Fanny’ is officially out on the web. The trailer was trending online within hours of its release, and audiences have plenty of reasons to be excited about the film, which is slated for release on September 12, 2014. Apart from mega stars Deepika and Arjun, the film has a stellar supporting ensemble which includes actors Naseeruddin Shah, Pankaj Kapoor and Dimple Kapadia. 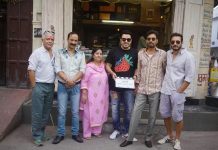 The film which is being publicized as a satirical drama, will have director Homi Adajania at the helm of affairs. Homi has earlier enraptured audiences with his queer moviemaking style in films like ‘Being Cyrus’ (2005), Finding Fanny too seems to have that quintessential eccentric trademark. Filmed in the scenic locales of old Goa, the film promises to be a quirky, but entertaining one. Moreover, this will be the first time that Bollywood’s leading lady Deepika Padukone will be paired opposite the relatively new Arjun Kapoor, their chemistry shall be an enigma that audiences will be intrigued to watch unfold on-screen.